TO BE USED FOR EXTREMELY AGGRESSIVE REMOVAL. WILL DIG THROUGH INDUSTRIAL STRENGTH COVERINGS, WATER-PROOFING MEMBRANES, THICK EPOXIES, AND MORE. 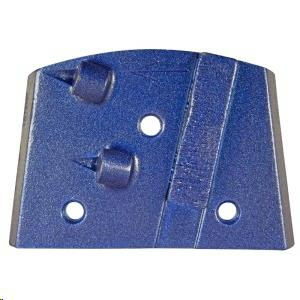 THE BACKING SEGMENT PREVENTS THE PCD FROM DIGGING/GOUGING DEEP INTO THE CONCRETE. THIS CAUSES A SLOWER REMOVAL RATE FOR THICKER COATINGS.